Save your old discontinued IKEA Stromstad sofa from the landfill with our replacement IKEA sofa covers. These custom Stromstad couch covers come in 70+ exclusive fabrics & customisations to choose from. We even have leather or fabric slipcovers for the IKEA Stromstad, for a complete makeover. 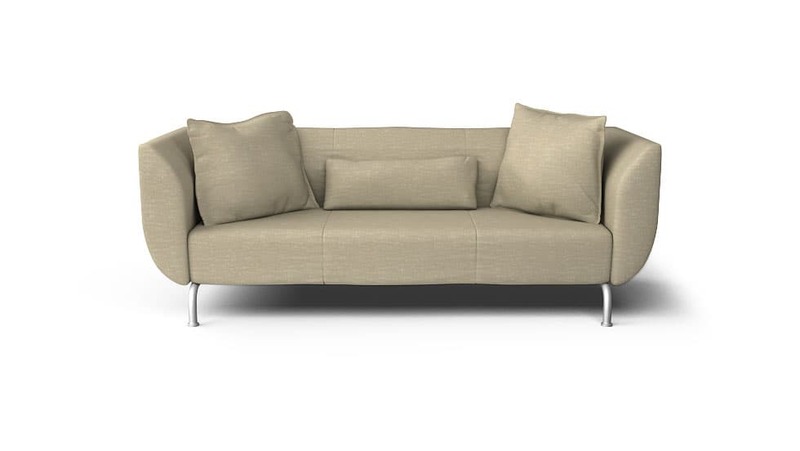 Custom slipcovers for IKEA Stromstad 2 and 3 seat sofas available here. The Strömstad slipcover set also comes with a pair of throw cushion covers. Nothing says premium more than combining lush fabrics with a stylish looking sofa. Get our super comfy Rouge (Velvet), Shire (Wool) or Herringbone fabrics to kick your IKEA up 2 notches. Give your IKEA Stromstad sofa a much-needed upgrade with our handmade, custom replacement sofa slipcovers. Choose from over 70 gorgeous fabrics, including linens, leathers, cottons and velvets, and customisations such as pleated skirts, contrast piping and side pockets for a look that's completely your own. Ready to start upgrading your IKEA Stromstad? Simply order a pack of fabric samples that you can test at home and let us guide you through the process of designing the perfect IKEA Stromstad sofa slipcover for you. All our slipcovers are delivered anywhere in the world for free, and come in a beautiful, reusable bag that you can use to store your covers in. Plus, every component of your covers are individually labelled to make installation on your IKEA Stromstad as easy and hassle-free as possible. They also come with a 3-year warranty that guarantees your satisfaction because we're 100% confident that you'll love your slipcovers and how they'll make your IKEA pieces for many years to come.